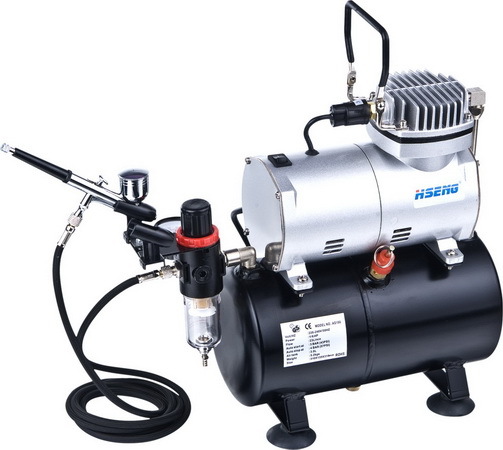 Ningbo Haosheng Pneumatic Machinery Co., Ltd (Haosheng) is a 15 year old professional manufacturer, specializing in oil-free and low-noise mini air compressors, airbrush kits and accessories products. A large part of their 200,000 unit per year production is sold in the USA under private brands from other importers. We choose to use the Ningbo Haosheng brand name as it is well known globally. We have been importing and selling Ningbo Haosheng products for nearly 10 years with outstanding results. Ningbo Haosheng is one of few Chinese industries that has been awarded ISO9001:2000 Certification. The quality is so good that we offer a 90 day Unconditional Guarantee against any and all defects and performance. l Air tank, providing smooth air flow, zero pulse. 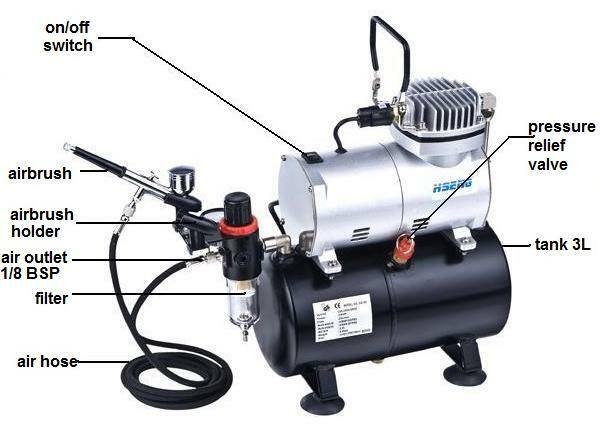 l Air pressure gauge, air filter, pressure adjustable. Piston type; oil free. No air pollution. l It can start with air from the tank, continuous working, powerful. l Auto start and auto stop function. Safety protection device for air tank. Dimension: 329X150X330mm 13 x 6 x 13"